Roxy, the unwilling runaway dog. A four-year old Cradock girl called Nadia Blom won local hearts when she became pivotal in finding a family dog that had gone missing after a thunderstorm hit the town last Wednesday. Roxy, an 11 year old cross between an English bulldog and Spaniel, is petrified of thunder and seems to have squeezed through or jumped two gates to get out during the storm. Owners Ryno and Lucille Ferreira from Jacaranda Street notified the SPCA, then put a message on Facebook and before long the first clues started coming through. 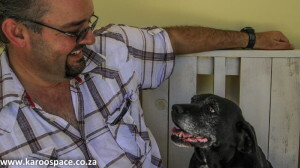 Reunited: Roxy and her master, Ryno Ferreira. She’d been spotted here and there, once on the corner of Sering and Protea Streets, looking confused and anxious. Ryno rushed there but she’d vanished. People shared the picture on Facebook and soon the whole of Cradock High School and other strangers were helping. Ryno put note onto Facebook to say that he’d just seen a lady walking around a piece of veld in her high heels, calling for Roxy. Another family living near the veld had put out a bowl of food and drink in case Roxy was somewhere close by. Ryno was enormously touched by the kindness people showed. He kept following up clues. 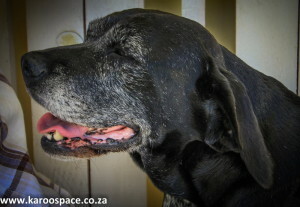 Some were depressing, like the news that a tannie chased the dog away in Spekboom Street. The gardener said she looked confused. Roxy had probably been sleeping there for a night or two. Ryno offered a reward of R1000 to the first schoolchild who found Roxy, plus another R1000 to the school. Dozens of people were out looking for Roxy or sending up quiet prayers and supportive messages on Facebook. By Saturday Ryno was hoarse from calling his dog. 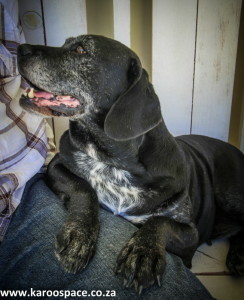 Dozens of Cradock people searched for this dog. By late Saturday afternoon, there seemed to be no hope left. But then at 7pm a man called Stefan Blom called. 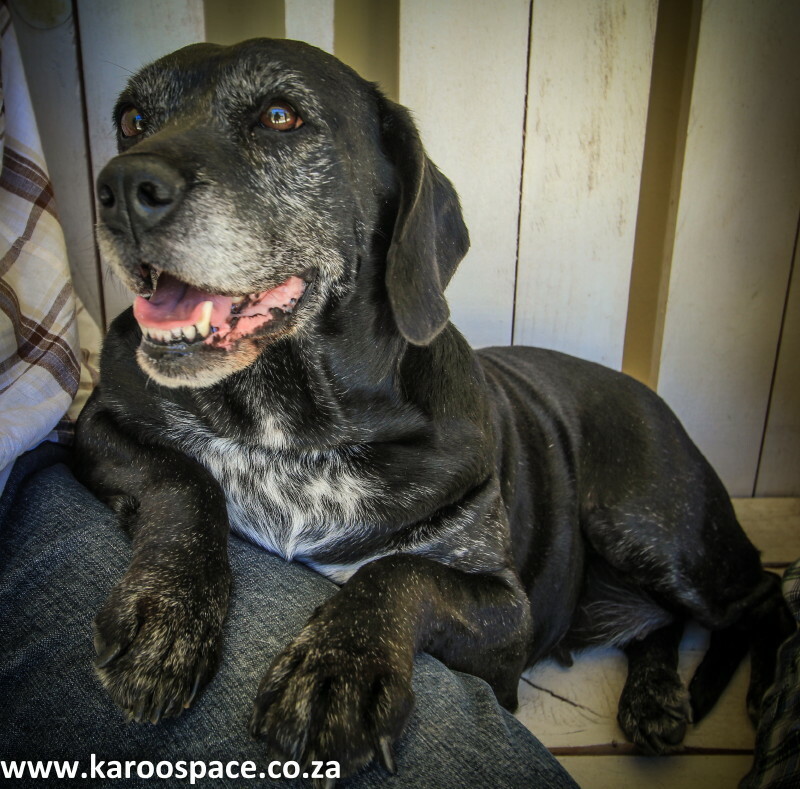 He and his family live on the corner of Victoria and Naested Streets, and they had just seen a dog matching Roxy’s photograph at Cradock weir. The Bloms had followed her but the dog moved away into the dense bushes. Ryno was there in minutes but she just vanished. All he heard was a single tjank, probably as a thorn pierced her in the thick Acacia scrub. Meanwhile Stefan’s daughter Nadia was terribly worried for the dog. He says she begged him to go and get the spotlight torch so they could find Roxy “because she’s so scared in the dark and Ryno is so sad”. They went out late, and glimpsed her before the torch spotlight died and Stefan had to make his way back to the vehicle in the dark, thorns ripping the skin on his legs till he bled. Before dawn, Nadia was up again and nagged her father about Roxy. By some miracle they found her. Stefan and his father-in-law Marius van Jaarsveld just happened to be at the right place when she appeared out of the bush and started trotting down beside the tar road towards Cradock. Stefan sent Marius to find Ryno while he walked behind Roxy, snapping pictures of her every now and then on his cell phone. “She’d stop and turn and look at me, and then carry on,” he said. Ryno arrived. He’d just been on his way to resume the search when Marius contacted him. Ryno stood in front of Roxy so that she could see him. He called and whistled to her as she approached but she was in such a state that she didn’t react until he touched her and she smelled him. When he got her home, she immediately sought out her food bowl and ate and ate. In a small informal ceremony, Ryno handed over the reward to little Nadia Blom, who sat shyly on her father’s lap. She immediately shook the envelope to see if there were any coins. When Ryno encouraged her to open it and look, Nadia peered in, then looked up shocked. 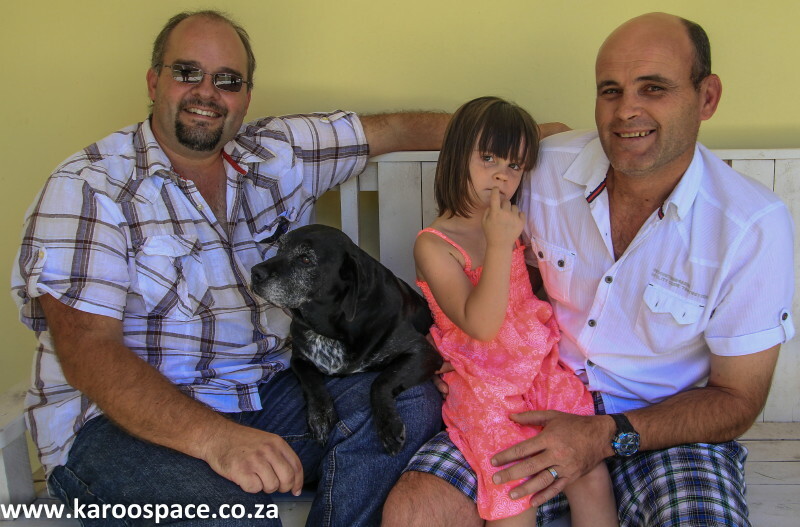 Nadia and her family are new to Cradock. They moved here from Fort Beaufort a month and a half ago. Nadia is enrolled with Cradock’s Krabbel and Klouter kindergarten. Ryno Ferreira back with Roxy thanks to little Nadia Blom sitting on her dad Stefan’s lap. 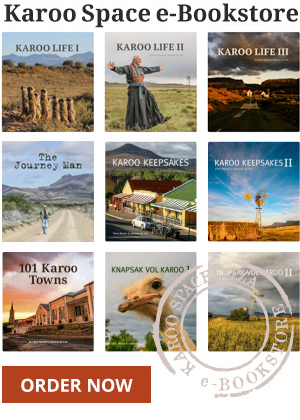 Cradock Turns 200 – In Style!